Sorry for the rerun. I'll try to make up for it with some book news. 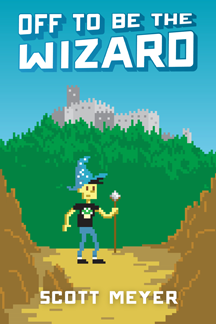 Here’s the cover of the second edition of Off to Be the Wizard, which was made by the design firm InkD. The second edition will be available on March 18th, and will cost pretty much the same as the current edition, which is available now. The second edition has been improved in a few ways. Some of the technical details have been fixed, some of the Esperanto has been re-translated, and I've added over 4,000 words worth of material to the narrative. Anyway, I’m ridiculously proud of the book, regardless of which edition you read. Thanks for your support.